Recorded on June 12, 2016. Welcome to Burden Hill – a picturesque little town adorned with white picket fences and green, green grass, home to a unique team of paranormal investigators. 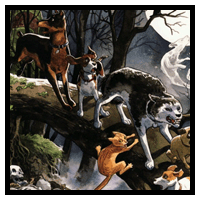 Beneath this shiny exterior, Burden Hill harbors dark and sinister secrets, and it’s up to a heroic gang of dogs – and one cat – to protect the town from the evil forces at work. These are the Beasts of Burden Hill. Check out Jason’s site, Eric’s site, and the entire Gutter Trash Podcasting Network. I just learned about Beasts of Burden about a month ago; it came out in a period where I didn’t have much time or money to check out new stuff and subsequently fell through the cracks. It sounded like something I’d really be into, and after hearing you guys talk about it I think I need to track it down ASAP.